Which all-in-one printer delivers ‘excellent print quality for documents and photos, above average scanning and copying speeds and easy operation’ for under $200.–PC Pitstop. A multifunction printer (MFP) or “all-in-one printer” is one of the cornerstones of a home office. These workhorses do everything – from printing documents and photos, to copying, scanning and even faxing (yes, some people still fax). This excerpt appears with the permission of Techlicious. 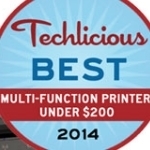 Techlicious all in one printer, multifunction printer, printer. permalink. Can’t say much about the Epson, Brother or Cannon Printers as I have never used one. I can say that HP 7520 is a great multipurpose printer, have one in the office. I have one question for you though? In all your research I have never seen you say anything about Lexmark. I have had Lexmark multipurpose printers since 1990s and have always been well pleased with them. I presently have a Lexmark Pro 900 that has not given me one once of problems in the past 5 years. I use it for everything, Fax, Copy, Printing and scanning and it has never failed me. I do use genuine Lexmark ink and am pleased with the quality and quantity of the cartridges. Maybe I have a fluke, but I have had such good luck with my Lx Pro 900 that IF this one ever dies I will buy another Lexmark. @Bob Seeberger: An automatic document feeder was one the key criteria for our review, which the Epson XP-610 doesn’t have. Obviously, it’s a judgement call, but we believe an ADF is much more useful for a broad cross-section of consumers than the ability to print on optical disks. Printer manufacturers probably have harder data to back that up, and that is why so few printers come with optical printing ability.